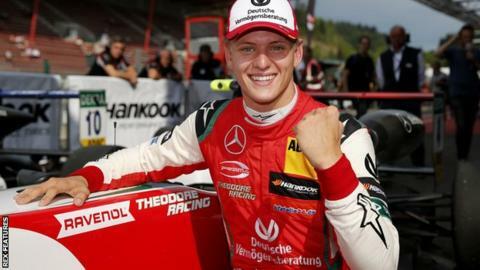 Twenty-six years after Michael Schumacher won his first Formula 1 race, son Mick has enjoyed his maiden Formula 3 victory at the same circuit. Spa-Francorchamps is synonymous with the Schumacher family, with Michael making his debut for Jordan there in 1991 and claiming his first win a year later for Benetton on the same track. It was a first win for 19-year-old son Mick in 45 attempts in the F3 series. "It seems Spa is a good place for the Schumacher family," said the teenager. Speaking to German publication Sueddeutsche Zeitung, he added: "I'm so happy about this victory, the only thing I can say is goosebumps." The Prema Powerteam Dallara-Mercedes driver overtook two of his team-mates to win from sixth on the grid after also suffering a collision during the opening lap in wet conditions on Saturday. He said coming through difficult phases was "a Schumacher strength in general", adding: "I do believe that I have that in my genes." Last year, on the 25th anniversary of Michael's maiden F1 win, Mick drove one of his father's old cars in a demonstration run before the race at the Belgian circuit. "It was just great. It was a pleasure for me to drive and it was emotional and fun and amazing. There is a lot of history with it and I'm really happy I was able to drive it," he told BBC Sport at the time. Schumacher senior suffered serious head injuries in a skiing accident in 2013 and has not been seen in public since. He enjoyed 91 race wins and seven world titles during his career, clinching the last of those at Spa while driving for Ferrari in 2004.